And which is worse? A form of writing which might inflict upon us the fourth constitutional wound (after Galileo, Darwin and Freud) to suggest, not only as Darwin did, that we might not be so dissimilar to nonhuman animals after all, but that as both Freud and Galileo put it, the universe does not revolve around us as the centre. Or a writing that grounds itself in the certainty of our special importance — as Harold Bloom wrote, ‘proper’ literature is concerned most of all with the human condition — but which then carves us out of webs, habitats, connections: nature. Which is worse? The energy driving a new and rising literature about animals (‘about’ is always a tricksy word, imprecise) has some of the same waters found in the stream that motivates veganism, critical animal studies, animal liberation activism: that our anthropocentrism, in “shutting out other beings”, is the very epicentre of the vicious, violent, degrading, destroying practices of what it means to be human, today, at the expense of those excluded from that increasingly arbitrary category. Wildlife, farmed animals, insects, our environment, our ecologies. Our planet and fellow co-tenants, as Dominic Pettman calls them in his work on human exceptionalism. We see ourselves — because this is how we talk, spin, write about ourselves — as at the very centre of life, of central importance, with all other species of little or no consequence. And regardless of our achievements, our better natures, our heightened abilities in tool use, techne, and poesis, our ability to create, it is the mindset of anthropocentrism, this systematic and mechanical way of thinking ushered in by Descartes and the Enlightenment (which of course Descartes immediately projected outward onto animals — they are the machines, not us; but of course, as Agamben has already shown us, this was the anthropological machine alive and well and working) it is this thought of anthropocentrism that puts the human above all other species and therefore central to all ethics. It is anthropocentrism that puts our ‘special’ skills and capabilities to such destructive use. We are not different from other animals, however. Just more extreme. It’s obvious (to some of us at least) that if we classed other species and forms of life as citizens — as nonhuman persons — as India has with dolphins, as Ecuador has done with rivers, as New Zealand has done just this week with a mountain — then we would not be able to so easily set upon them, nor perhaps so easily ignore their needs in our goose-stepping march toward progress. 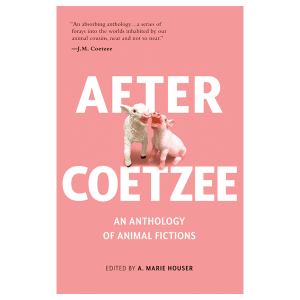 “A literature meant to take seriously that animals are beings with prerogatives seemed fantastical,” writes Houser of starting out on the project of this anthology of animal fictions. Once. Once it seemed like that. (Not back in the 15th and 16th centuries, in fact; evidence that not always have we been so inimical to the idea of animals as equals.) But not for a while. 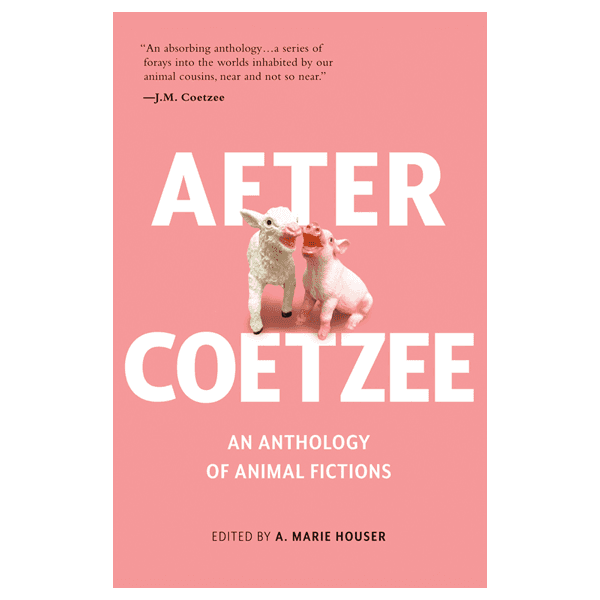 And yet after Coetzee, and after After Coetzee, there is a line for walking, a line for writing, of the value, importance and imperative for such a literature that recognizes — through imaginative creation, through perhaps a voluble and unabashed anthropomorphism (or even a gleeful zooanthropism?) — the need for spaces such as these. Because it is this literature that will “shake up our somnolent automatomisms” writes Houser to undo and outdo the anthropocentric urge, which is little more than a bad habit, to separate ourselves from the vulnerability of animal corporeality from which we shut ourselves off, apparently at all costs.